Never leave your laptop in a vehicle overnight during cold weather. Even if it is in a well-padded and insulated laptop case. Your laptop could freeze and you would lose all your important data. 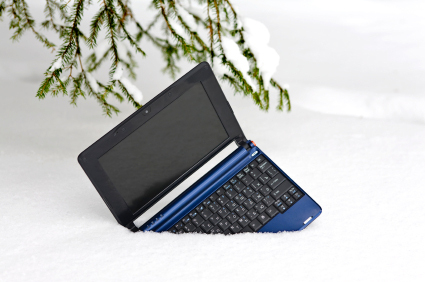 Once in from the cold, let your laptop warm up to room temperature before booting/turning on. A good rule of thumb is to wait at least 15 minutes. The same holds true in warm weather. Let your laptop acclimate to outdoor temperature changes. Do not use your laptop while it is still inside a laptop bag. Air circulation is important, and it will overheat if there is no room for air to circulate. If you know your laptop will be exposed to extreme temperatures, it’s always best to check your documentation from the manufacturer or contact their support center. All laptops are not created equal, and computer components could react differently to extreme weather. If you have questions about your laptop, the highly skilled staff at Brazos Internet can handle any problems you may have. Follow this link for a list of some of the more common issues we encounter. If you have a problem, just call 940.564.5659 or dial 1.800.687.3222, we can help!